You can both emit light and sense it at the same time (almost) which leads to a whole slew of applications such as varying output intensity with light levels, bi-directional communication with a single device, etc. The reason we need to use a micro-controller with LEDs is because their reverse current is so small that we need to use a special property of LEDs in order to make them do double duty as a light sensor. Making use of this property requires a micro-controller. Like many electronic components, LEDs have a small amount of parasitic capacitance associated with them. While normally such properties are a potential problem, in our case, we can use it to make it into a photo-detector. Here’s how. Hook up the LED in reverse, connecting the cathode to the micro’s pin, and the anode to ground as shown in the diagram on the left. If the pin is set to output-high, it will charge the LED’s parasitic capacitor. It only takes a millisecond or less for this to happen, so the charging procedure is very fast. Next, set the pin to input-low which allows the LED to discharge its capacitor. The rate of its discharge is proportional to the amount of light reaching the LED. Under direct lighting, it only takes a millisecond or so to discharge enough to trigger the input low. In dark conditions, it can take a few seconds for it to discharge enough to trigger the input pin. By measuring the time it takes the LED to discharge, we can tell how much light it is detecting. The amazing thing is we can do this measurement with only one pin, and a digital pin at that! By connecting the cathode to another pin (with a series resistor to limit the current), we can also illuminate the diode when we are not using it to sense light. You can use this technique to not only make the LED’s brightness in proportion to the ambient light level, but even use it for bi-directional communication. There is another property of using the LED for measuring light levels, and that property is color spectrum filtering. What that means is that the LED responds to light only within a particular color spectrum. This property can be a problem or an opportunity depending on what you want to do. LEDs will only respond to light frequencies (i.e. colors) that are equal to or higher than that frequency that the LED emits at. Therefore, if you want to sense daylight levels, you should use a red or yellow LED. If you want to measure only the blue through ultra-violet spectrum, then you can use a blue LED for that measurement. You also need to take into account the color of the LEDs packaging. If you use a red LED within a red case, you will only measure red light. Ditto with any other color. To summarize, LEDs act as a high-pass light filter when detecting, but their package is a narrow band-pass light filter for that particular color. You can use this property to measure individual colors, but that is really best done with specialized light sensor chips. The LED is best for cheap, readily available ambient light sensing and communication. For ambient light sensing, red and yellow LEDs are best, and make sure you use ones in clear cases. I have found an analogRead level of 512, which corresponds to 50% of Vcc limits the discharge time in the dark to about 300 milliseconds, which still giving a good range of sensitivity. You can of course, vary this level to suit your particular application. When the LED is used solely as a photo-detector, you do not need a current limiting resistor. If you desire to use it also as a light emitter, then you will need to add one in. The resistor itself is only for the forward biased state. It does not affect the reverse-bias detection operation. You are now armed with the tools you need to use an LED you have lying around to replace the need for a difficult-to-find CdS photo resistor. Even if you have no trouble sourcing CdS cells, it is now clear that LEDs are cheaper (by about 10 times) and easier to use. In most applications, you don’t even need an analog pin, but only a digital one. The code is simple as we have seen, and is easy to use and modify to suit your particular needs. Lastly, you have not only a simple, inexpensive solution, but the possibility of novel applications as well. Please share your comments and applications for using LEDs for photo-detection in the comments below. Cheap Alternative for Hard to Find CDS Light Sensor by Provide Your Own is licensed under a Creative Commons Attribution-ShareAlike 4.0 International License. 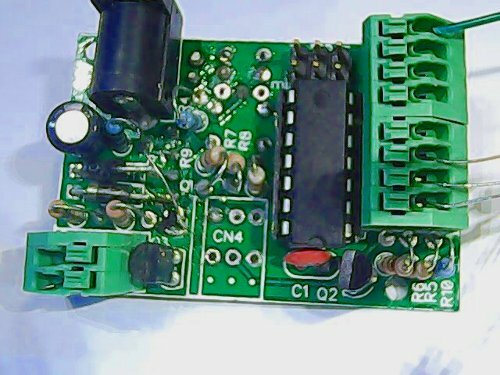 This entry was posted in Tech and tagged arduino, LED, sensor, tech. Section: Article. Bookmark the permalink. Both comments and trackbacks are currently closed. This is a very interesting article, so I tried to follow your setup, but somewhere things get stuck. The “photo” LED is connected to pin 12, as indicator I used the on-board LED at pin 13. Because there was no response, I checked with Serial.write, but ledVal is empty, nothing happens. Besides, you might want to change the digitalWrite arguments to either HIGH or LOW instead of ON and OFF. 1) You do not need a resistor if you are just measuring light levels. As long as you don’t forward bias the LED, no resistor is necessary. You don’t even need to worry about it (if you make a mistake) when developing your sketch. Since the AVR chips only output 40mA, I have driven LEDs from an output pin for short periods without harm. In the worse case, you might fry a cheap LED and have to replace it. 2) If you do want to turn it on, then use whatever size resistor that provides the current you want. For most low power LEDs (red, yellow & green) that would be 220 ohms, which would give you 15mA. Also, FYI, the resistor does not affect the sensor operation. Using the same LED as both a sensor and an illumination has some nice applications. One such application is to change the LED’s brightness according to ambient light levels. Another is to use it as a touch-switch with a built-in indicator (it would only work in decently lit environments though). Scott, I would like to hire you to build a small prototype device such as the one you mention above. Could you contact me at phayes@exactlynet.com. Also, in the class you can lower the 2000 number to something much much lower. Guys I’m new to this field, only few days experimenting, what is the class, and where to put it in order to get the thing rolling? your quick responce to my email is highly appreciated! Either create a file for the class and include it, or else just put it at the top of your sketch. See the Arduino docs on adding files to your sketch. However, when I built 4 LEDs with 1 meter flat cable in order to mount it on the servo to indicate light source, wanted to replace photoresistor as it says in this topic, it did not work, probably because of long cable, does someone have a solution to this. I’m wondering if a small coax cable or something shielded might do the trick? You are right about the problems measuring small parasitic capacitance. I have found some difficulty myself when the Arduino was no longer connected to earth ground. The first thing I would try is that – connect your Arduino’s ground to earth ground. That settles the measurement quite a bit. Next, you could try averaging several samples to reduce the noise. You can also try coax as you suggest. If all else fails, see if you can change your design to use a photo-transistor. They don’t rely on parasitic capacitance, and will work in all situations. Good luck. hey scott! seen and enjoy your work, now my question goes like this. if one decides to generate electricity from the light ,does one still have to use the LED for that purpose and connection still thesame?